Allied Market Research company predicts that the global market in footwear will reach $371.8 billion by 2020. If you are craving a piece of that pie, the world needs to recognize your brand. Your company must be capable of fulfilling orders across multiple channels, delivering shoes to the right feet at the right time. If your shoe company has supply chain bottlenecks or a lack of sales, it’s time to call in a footwear marketing agency to get that inventory moving. They have the team to help you in all areas of marketing, logistics and selling your shoes. Their many areas of expertise can surprise you. Marketing Objectives – So both parties know the goals. Financial Objectives – Work within your budget. Target Markets – Talk to the right audience on the proper channels. Market Research – Share what research you have. The agency will perform additional analysis to identify any gaps or trends. Pricing Strategy – Current pricing is a starting point to identify brand positioning. Be open with information for a better relationship so the agency won’t waste your money and time. Before your agency partner can begin their work, they perform an audit of your current status. Using these benchmarks along with your goals, they will build a plan to market your shoes. Once you’ve provided all the pertinent information, here is what a footwear marketing agency can do for you. There are three primary service areas that digital marketing agencies provide. Within each category, there are many specific elements required to build the brand and make your company a shoe selling dynamo. Social networking is another area where footwear marketers can drive business and create brand awareness. These days, social marketing is a full-time job requiring specialized tools and software to manage the various networks. Typically, a footwear marketing agencies' campaign requires expertise in a variety of marketing channels encompassing email, social, PPC, TV, print, in-store and OOH. Search for an agency who can handle all of it. It’s their job to figure out the best way to reach and nurture your audience whether you’re selling work boots or bunny slippers. 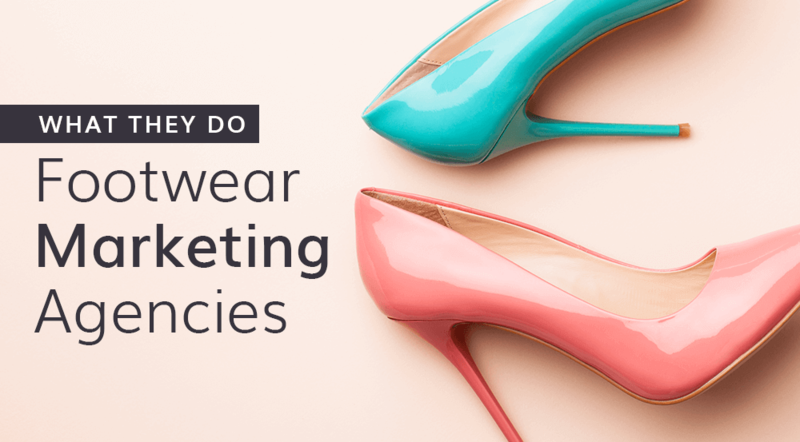 Marketing is just one big piece of your footwear puzzle. A footwear marketing agency should be able to advise on product and packaging design. The marketing agency team can also help with product design from a marketing standpoint. They can research and reveal trends that can put your brand ahead of the curve. From warehousing to shipping, there are many options, but not all of them are right for your shoe business. A footwear marketing agency has the resources and connections to help you create a logistics plan to streamline your business. Moving your shoes down the supply chain to your customer’s feet is an international operation. The experienced agency will help you simplify the fulfillment while reducing costs throughout the supply chain. A full-service footwear marketing agency is well versed in Marketing Strategy, Social Media Marketing, PPC Google Shopping, OOH Media Buying, SEO, SEM and CRO to name a few. Today’s shoe companies must compete in a multi-channel and omnichannel ecosystem. It takes planning and infrastructure to manage the day to day operations and growth. Your agency will advise you on the platform for your online stores and the software tools to run your business. The agency will typically partner with other companies that handle the various segments of your business from social and email marketing to packaging and fulfillment. They can help you get your shoes worn by the right influencers to put your brand on the map in the right circles. They will also unify your brand so that the in-store POS branding matches your online logos, colors and images. Marketing footwear takes experience. A footwear marketing agency can provide all the tools, ideas and talent necessary to build your brand. Building a brand and creating a loyal following requires orchestrating many types of marketing and behind the scenes tactics. However, brand building takes time and a commitment from both the agency and client. Considering that website SEO alone can take three months or longer to see returns, an open, honest agency/client relationship is critical for the success of any marketing program. To see a real ROI, plan on staying with the agency for a minimum of two years to realize the results of the planning, implementation and hard work. When you are ready to dominate your footwear niche, call on the Eventige team. We have experience in both the retail and wholesale footwear environments and have the resources to build your brand nationally or internationally.